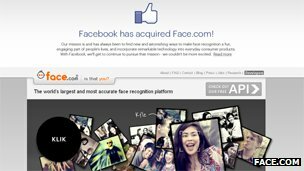 Social networking giant Facebook has decided to buy an Israeli startup specialising in facial recognition technology - Face.com. The firm already provides software that allows Facebook's members to identify and tag photos of their friends. The terms of the deal are not known, butReuters quotes estimates of $55-60m (£35-38m). Tagging is a popular feature on Facebook, but privacy advocates have raised concerns about the technology. Face.com's software scans photos Facebook users upload, and suggests friends they may wish to tag with just one click. According to the social network, the acquisition does not mean there will be changes to Facebook's current face detection and recognition systems for photos. "People who use Facebook enjoy sharing photos and memories with their friends, and Face.com's technology has helped to provide the best photo experience," said Facebook's spokesperson in a statement to the BBC. "This transaction simply brings a world-class team and a long-time technology vendor in house." UK campaign group Privacy International warned of what it described as the potential pitfalls of the technology. "Facebook are in the process of building the largest and most accurate facial recognition database in the world, and with great power comes great responsibility," the organisation's head of communications, Emma Draper, told the BBC. "We would hope to see very strict safeguards on how this information is stored and who has access to it, particularly if - as seems increasingly likely - Facebook is going to start making money from it." But Facebook refuted the suggestion that it was building a facial recognition database, explaining that the technology simply allowed people on Facebook to tag images of their friends quickly and easily, without allowing users to identify anyone on the social network unless they were already friends with them. Face.com is an 11-employee startup located in the heart of Tel Aviv's startup community on Rothschild Boulevard, locally known as the Silicon Boulevard. The firm could not be reached for comment, but in a statement on its website it said that "by working with Facebook directly, and joining their team, we'll have more opportunities to build amazing products that will be employed by consumers - that's all we've ever wanted to do". Face.com launched its first product in 2009, and also supports third-party apps such as Photo Finder, Photo Tagger, and CelebrityFindr, which allows Twitter users to search for photos of celebrities. Facebook has recently been expressing great interest in mobile and photo-sharing - in April, it bought Instagram for $1bn, and weeks later launched a photo sharing smartphone app called Camera. Both apps allow users to add filters and make other tweaks to photographs.